Timeframe - ZineWiki - the history and culture of zines, independent media and the small press. Timeframe is a fanzine by Evelyn Baker and Stephanie Bedwell-Grime. Published in Willowdale, Ontario, Canada, the first issue of this fanzine devoted to science fiction, fantasy, and media science fiction, appeared in 1979. 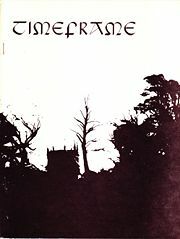 Eleven issues were released, as well as issue 4.5., published in 1983. The last issue appeared in the early 1990s. The fanzine contained editorials, fiction, poetry, art work and letters of comment. Fan Fiction, featuring characters from televison shows and movies such as Battlestar Galactica, Indiana Jones, Star Trek (TOS}, Star Trek: The Next Generation, Star Wars, and Voyage to the Bottom of the Sea, as well as original science fiction was also featured. Contributors of writing included Jacquie Allinson, Rhiann Amberdon, Evelyn Baker, Gordon Baker, Marg Baskin (Amantes de la Noche), Cynthia E. Baughn, Deborah A. Baughn, Stephanie Bedwell-Grime, Marie Benedict, Ellen E. Blair, Elizabeth Carleton, James R. Collier, Nigel Conliffe, Forrest Fusco, Jr., Janine Goldfarb, Bev Grant, Mary Horsburgh, Christine Jeffords, Julie Lewis, Constance Lilliss Dickinson-Otty, Shelley Mars, Norma Mergenhagen, Laura Michaels, Charles P. Nadeau, Maggie Nowakowska, Anne Ostrom, Lloyd Penney (Torus), Bob Powers, Lemora Sauder, Steve Skyler, Jacqueline Taero, and Samantha Winters. Contributors of artwork included Jacquie Allinson, Bob Azzarro, Evelyn Baker, Derek Grime, Pam Kowalski, Don Lewis, Julie Lewis, Joanne Par, Lloyd Penney, Bob Powers, Debra Pugh, Leah Rosenthal, Laurel Russwurm, and Steve Skyler. Covers were by Alicia Austin (Kevas and Trillium), Mary Horsburgh, Wanda Lybarger, Joanne Park, and Karen River. Later, Stephanie Bedwell-Grime began to concentrate on horror fiction, and was nominated for the 2000 Aurora Award for Best Short-Form Work in English for her story "Skin Deep", which appeared in the January 1999 issue of Imelod. She has been a five-time finalist for the Aurora Awards, and has written ten novels and numerous short stories. This page was last modified on 3 September 2018, at 13:17.